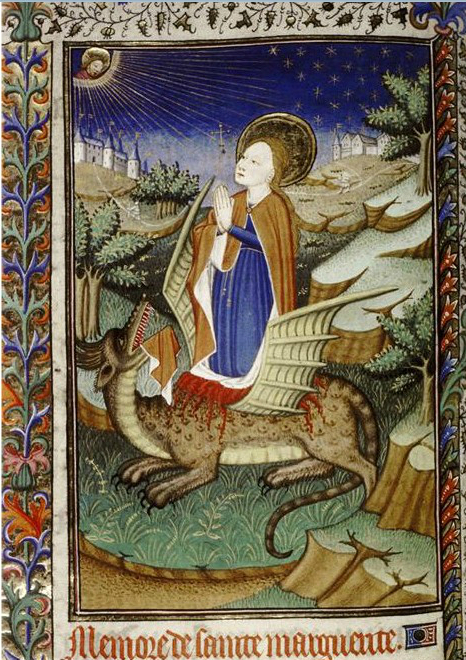 This is an image of St Margaret of Antioch from a book of hours, which is a private prayer book. For a basic retelling of St Margaret’s story, see the Medieval Sourcebook for James of Voragine’s Life of St Margaret from the Golden Legend. A book of hours like this one would include an image of Margaret followed by a prayer to her. The image below provides an example of a prayer to St Margaret from a book of hours.